THE STORY - Lazzaro, a good-hearted young peasant, and Tancredi, a young nobleman cursed by his imagination, form a life-altering bond when Tancredi asks Lazzaro to help him orchestrate his own kidnapping. ​Something that has often been a point of contention with the Foreign Language Film Oscar is the rule that states only one film may represent a country for the prize. Taking out the political decisions that can exclude some films from consideration, it often just means that it’s unfortunate when a country is not able to give more recognition to another film that is just as deserving. Italy decided to select another film to represent the country for the Oscar ("Dogman"), and personally, I feel that was not the correct choice. This particular film is one that is dazzling and exciting to view and deserved to have that platform because it is quite a special gem. 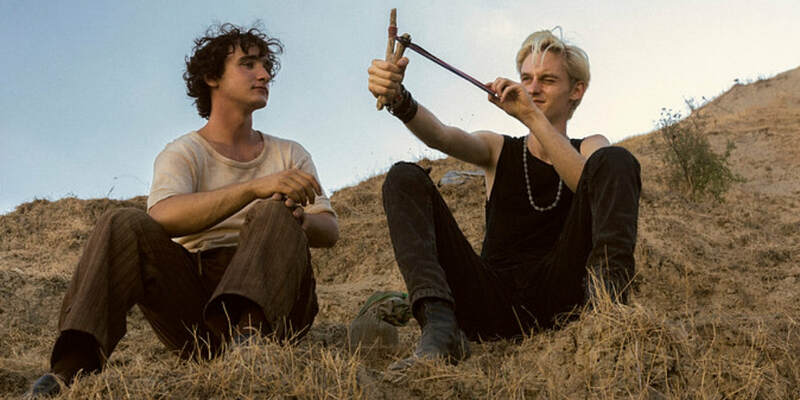 "Happy As Lazzaro" opens on a small Italian countryside in an unspecified but seemingly not too distant past. The village is inhabited by a vast collection of people that work on the tobacco farms. At the center of this group is Lazzaro (Adriano Tardiolo), a sweet-natured young man who feels rather content in his situation. This is true for most of the village residents, even though they are being exploited by the owners of the land to get free and illegal labor. Lazzaro’s journeys has him interacting with all sorts of people, from his fellow workers to the land barons, and it eventually takes on a fantastical side that propels him into the future where he discovers more revelations about his community. The tone and style that director Alice Rohrwacher crafts here is quite stunning. There is an ever-present dreamlike quality that surrounds the film, particularly in the serene countryside. It morphs into something starker when the metropolitan city is featured in the second half but still manages to maintain a sense of beauty in its images. Rohrwacher does a fine job at authentically realizing a timeless sense to this story that gives a fairy tale essence to the film. Her direction always engages the most fascinating aspects of the story, greatly enhanced by the picturesque cinematography from Hélène Louvart. It is a style that excels at creating a warm atmosphere to investigate the film further. Credit should also be paid to Rohrwacher’s script, which often times feels deceptively simple in its characterizations which soon turn into something quite profound. The narrative has a playful energy to it, and as it reveals more depth, it encounters themes of family and loyalty stretched across many years. The screenplay makes good use of its concept to continually keep one invested in this plight that has tragic overtones but never feels completely melancholy. Instead, it warmly invites you to look into this tale that takes on a spiritual quality of learning through time. This truly is a screenplay that pays a great deal of attention to ensuring the voyage taken is one that is thematically satisfying as well. This is a film where so much attention is paid to the filmmaking details that it does seem as if the performances go by the wayside a bit. This is not to say that there aren’t good actors populating the cast, but it must be said they don’t make the biggest of impacts. This is particularly felt with Tardiolo’s performance. By no means actively bad, his portrayal does suffer from the nature of the character itself. Lazzaro is meant to be seen as a rather meek and gentle figure, but that, in turn, makes him rather passive and a bit uninteresting when poised as the film’s central figure. The story that unfolds around him is much more inviting than the performance is, and the rather bland persona does hinder the engagement a bit. The cast of actors around him are mostly unknown to American audiences, and they help to give a nice flavor to the world in the film. Overall the cast is capable if not completely astounding.